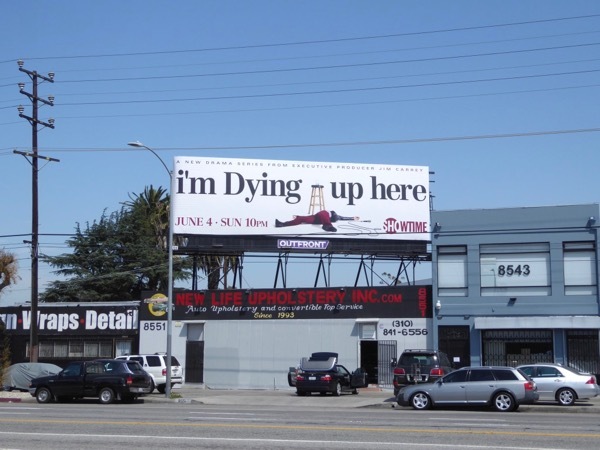 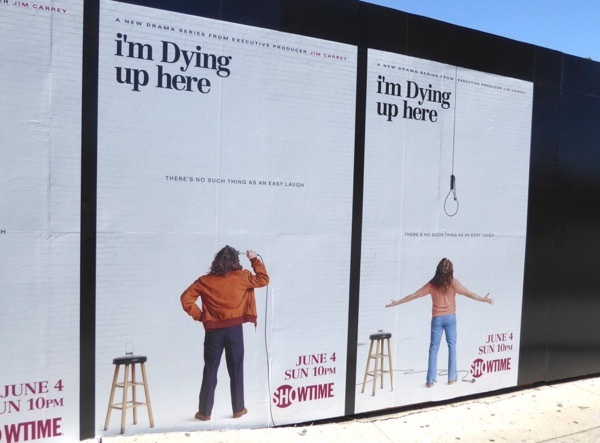 This summer Showtime flashes back to the past to delve into the infamous L.A. stand-up comedy scene of the 1970s in I'm Dying Up Here. 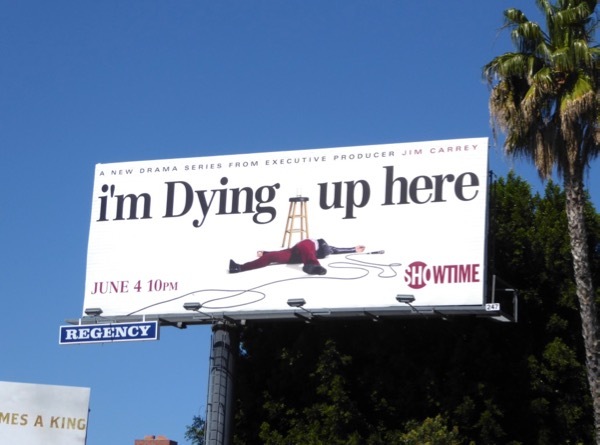 Set in 1973 the drama revolves around the lives of fictional stand-up comics at a Los Angeles comedy club run by Melissa Leo's 'Goldie Herschlag', who is loosely based on the legendary owner of the Comedy Store, Mitzi Shore. 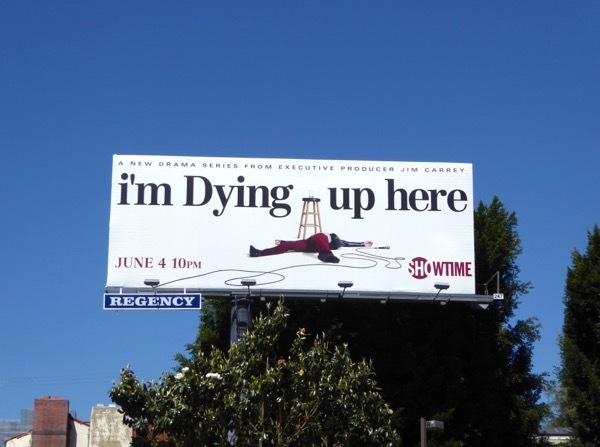 The dramedy is adapted from William Knoedelseder's 2010 book of the same name about the golden age of the L.A. comedy scene and stars the likes of Ari Graynor, Michael Angarano, Andrew Santino, Clark Duke, Al Madrigal and Erik Griffin all trying to make people laugh on the stand-up circuit. 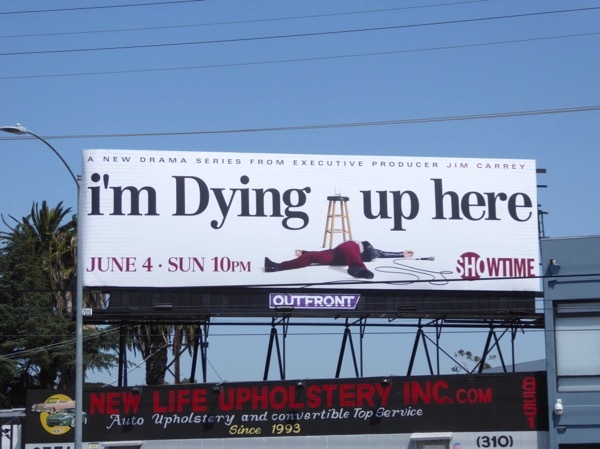 The show's dramatic title and key art certainly have great stand out in the sprawling city skyline. 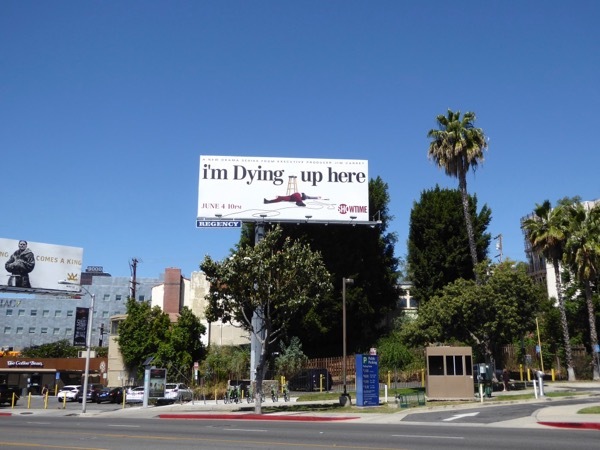 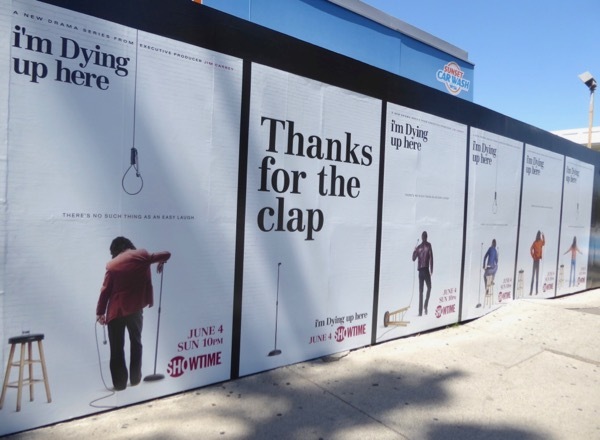 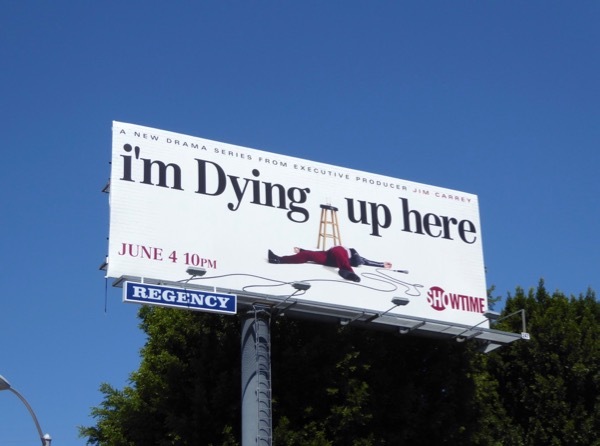 The series premiere billboard was first spied above West Hollywood's Sunset Strip on April 27, then spotted later along Venice Boulevard on May 23, 2017. 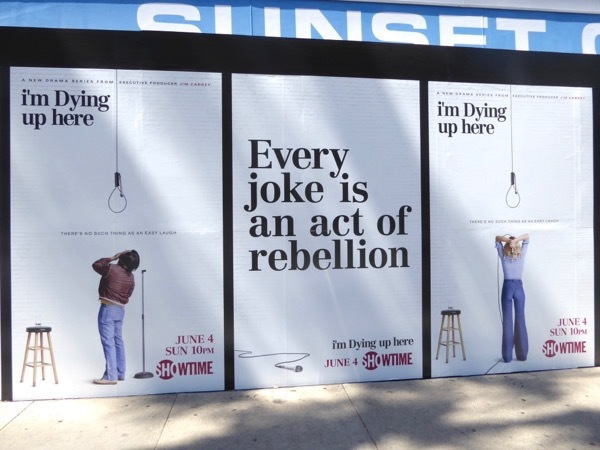 Meanwhile the accompanying launch street posters were snapped at the Sunset Car Wash on May 28, 2017. 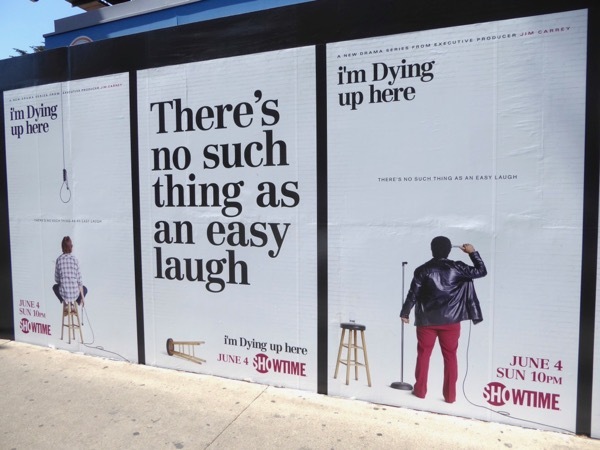 In show business there's no such thing as an easy laugh, so let's see if this 70s comedy series can tickle some funny bones this summer and provide us with some much needed humour.